Do you wonder why some garden borders seem beautiful to us and others seem more of an unattractive mess? To understand this it is useful to consider how our brains perceive what our eyes detect. Our brains don't make us "see" everything available to the eye. In fact our brains find more meaning in simple and orderly patterns and they ignore information that over-complicates scenes. Repetition in garden border design is a really powerful tool to create pleasing patterns and it can be used in different ways. Once you understand why repetition works, we promise it will easy to apply it in your own gardens! Read on to find out more. We do realise that their is a fair bit of science and psychology in this post but don't let that put you off! If you have seen our post "What Exactly Is Garden Design?" you will know that good garden design usually follows simple rules and that these are based on design psychology. Our eyes are continually scanning in 3D when we look at a garden border. They scan in up-down, left-right and front-back directions, helping our minds looking for patterns that they can make sense of. If every single item in our field of view is of similar size, shape and colour, or there are simply too many different objects in it, we don't see the patterns that most of us find plasing. That's why we find well-designed garden borders more attractive than a patch of nettles in a woodland edge. There are different ways to introduce pleasing patterns into garden borders using repetition. Here we give you 8 options to adapt to your own gardens. Enjoy! When we first look at a scene such as a garden border, there is a bit of a hierarchy in what we perceive first. Usually it is the outlines of familiar shapes that we notice first. A series of similar, well-defined plant shapes will be recognised more quickly than a jumble of many different shapes. In garden and landscape design the overall shape of a plant is more usually known as the plant form. Plants can be upright, columnar, mound-shaped, cascading, horizontal spreading, weeping, vase shaped, spiky, oval etc. Repeating the same form, or a restrained number of different forms makes a much more successful border design. In the image above, a series of mounded forms are used, with contrast provided by colour and texture. In the image to the left, all of the plants have upright forms, again with varying texture and colour to add interest. In the more formal garden below, repetition is used in the mound shapes of the Buxus balls, in the rectangular hedges, in the vase shapes of the pink Phlox and in the spreading horizontal effect of the white flowers in pots. The columnar tree trunks are also repeated. However, formal or informal you want your borders to be, try to repeat some plant forms either more frequently for a formal effect or less frequently in a more informal style. Repeated and restrained colour palette of brown, red and pink leads the eye down the path and across the pond on an easy to follow journey. Designer: Tom Stuart-Smith. Image: Chris Denning/Verve Garden Design. Colour has a very strong influence on many of us in gardens. While some designers consider plant form first and foremost when designing garden borders, others pay very careful attention to colour combinations. Regardless of whether you like to see many or fewer colours together, repeating at least one or two main colours within your scheme will make it feel more cohesive. Contrasting shades of deep pink/purple and white/pale pink provide the repetition in this border at Wollerton Old Hall. Image: Chris Denning/Verve Garden Design. In the image above the autumnal brown of the grasses is the dominant colour that adds continuity to the scheme. The deeper reds and pinks are repeated more sparingly for contrast. In the left image, different tones of purple and pink are woven throughout the border, while blocks of white provide a calm and bright contrast. Interestingly, a similar colour scheme is used in the example below, with the addition of orange Californian poppies for added zing. Although the use of seed mixes to create the meadow-style planting creates a more random effect, patterns still emerge from each of the different colours. If you want more ideas for meadow-style, see "7 Best English Gardens For Meadow-Style Planting". While fond of vibrant colours in his "Pictorial Meadow" style planting, Nigel Dunnett has repeated orange, pink, blue and white that intermingle to create mesmerising patterns at Trentham Gardens. Image: Chris Denning/Verve Garden Design. Dwarf pines providing a strongly-textured element in different shades of green. Image from Picton Garden: Chris Denning/Verve Garden Design. Plant textures can add as much interest to a border as flowers. Texture varies with the amount of roughness or smoothness of the leaves and whether leaves are solid or dissected. A stunning example of repeating a plant texture is shown above. At the Picton Garden in Worcestershire, the fluffy texture of different dwarf conifers is repeated to provide an interesting foil for the dramatic red hot pokers (Kniphofia rooperi) and small-flowered Asters. In the central image a few different textures are repeated in a more random pattern in this vertical living wall. The coral-coloured Heuchera and trailing ivy have a more solid, course texture while the different ferns have finer, more delicate textures. Together the effect is rather lovely, but it is the repetition that is key to it's success. Even greater contrasts in texture are evident in the example below. The small, densely-packed leaves of the Buxus balls and looser Lavender contrast sharply with the solid leaves of the Iris and Saxifrage. The repetition in this planting scheme allows the textures and plant forms to take centre stage- a useful trick with more ephemeral flowers. Repeated, contrasting plant textures providing rhythm and harmony in a mainly green planting scheme. Designer:Jo McCreadie for Marshalls Paving. Image: Chris Denning/Verve Garden Design. Movement from repeated upright grasses immerses you within the space and encourages you to linger. Designer: Tom-Stuart Smith at Broughton Grange. Image: Chris Denning/Verve Garden Design. 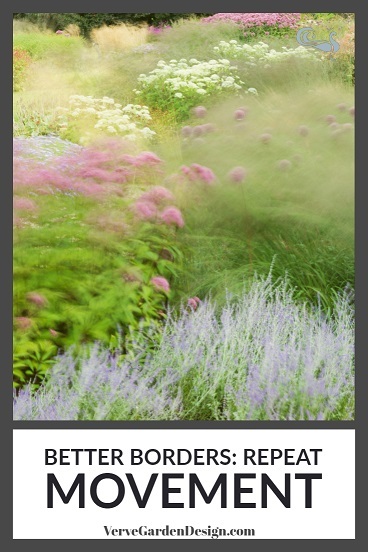 Movement adds additional excitement to a largely static garden border. It causes the eyes to focus on the moving areas and scan them more than if they were still. The sound also adds a pleasurable element to the experience. However, like in the other examples of repetition in this article, if everything was moving, the scene would be too chaotic to be enjoyable. Therefore repeating sections of more willowy plants works best. Ornamental grasses, bamboos and tall, airy prairie plants such as Verbena bonariensis or the perennial sunflower Helianthus 'Lemon Queen' will move even in gentle breezes. Drifts of gently-moving grasses interspersed between more static plants pulls the eye in. Designer: Piet Oudolf at Trentham Gardens. Image: Chris Denning/Verve Garden Design. Our three examples all highlight grasses. At the top, a variety of upright grasses keep your attention on the scene for longer when they are moving. In the central image, billowy grasses are useful in the centre of borders to draw your eye in. Below the repeated arching grasses catch the breeze along the side of the path and encourage you to explore furhter along it. Deep blue lupins, taller than the other plants, lead the eye deep into this garden scene. Designer: Nic Howard. Image: Chris Denning/Verve Garden Design. So long as they are not towering above our eye level, we tend to notice taller things first. Think small trees, then taller shrubs, taller perennials and finally lower-growing ones. This is illustrated in the garden above, where the sculptures are dominant but then the eye is drawn to the taller spikes of cobalt-blue lupins before it focuses on the detailed planting below. In the middle scene, the trees, garden building and boulders attract our attention before the flatter, meadow-style planting below. If you want the eye to travel throughout a space, adding a series of trees or taller objects is a useful technique. The country garden below repeats shrubs of similar height and form in the mid-ground to give the garden a structure that sits well with the surrounding rolling hills. Try repeating some taller plants or objects in your garden to give continuity and flow. Shrubs of similar height and shape form a pleasing rhythm towards the seating area below. Image: Chris Denning/Verve Garden Design. Contrast between the rounded form of the roses and the tall, upright form of the foxgloves is repeated throughout this densely-planted border. Designer: Jonathan Snow. Image: Chris Denning/Verve Garden Design. Our minds are really good at distinguishing similarities and differences in what the eye detects.. That is why contrast is so important in garden design. Contrasting dark green and silvery leaved plants are repeated for a calm effect. Designer: Tom Massey. Image: Chris Denning/Verve Garden Design. If there are too many contrasts this can create confusion or tension. By repeating a small number of contrasts however, a much more desirable effect can be achieved. In the garden above the two dominant shapes of upright foxgloves and rounded roses provide contrast that is repeated throughout. Contrasting leaf colours work well in the central image and repeated blocks of mounded green alternating with slightly taller dark Lupins, Astrantia and Salvia nemorosa 'Caradonna' (below) provide spectacular colour contrast. Check out our post "12 Garden Border Planting Design Trends to Take From Chelsea 2018" for other ideas of contrasts to try. Strong contrast between deep-coloured flowers and lighter green leaves repeated beautifully. Designer: Naomi Ferrett-Cohen. Image Chris Denning/Verve Garden Design. Clipped yew hedges with a random series of topiary create rhythmn and a strong backdrop for the exuberant planting at Renishaw Hall. Herbaceous border designed by Arne Maynard. Image Chris Denning/Verve Garden Design. In borders with lots of plants (or lots of intricate, small flowerheads) a plain backdrop helps the eye focus on the planting. Backdrops can be hedges, fences or plants with less textured foliage (for some ideas see our article "12 Best Small Garden Design Ideas from Chelsea 2018"). By repeating the same backdrop in several places in the garden, the space feels more unified and allows the emphasis to be where you want it. Sculptural artichoke balls (from A Place in the Garden) woven through a simple border of Alliums and Buxus balls act as a whimsical backdrop. Image: Lorraine Young/Verve Garden Design. Here we show some ideas for different size gardens. The large country garden above repeats formally-clipped yew hedges tall enough to be a backdrop for even the towering painted obelisks. The central image shows how sculptural structures could be used as a backdrop in smaller gardens. Below, we liked the way that the upright fronds of the fern clumps provided a natural-style backdrop to the bell-shaped Granny's Bonnet (Aquilegia) flowers. The delicate flowers of self-sown Aquilegia are enhanced by the ferny backdrop throughout the Rockery Garden at Lowther Castle. Image Chris Denning/Verve Garden Design. The Tom Stuart-Smith designed parterre at Broughton Grange in Oxfordshire is a modern version of more formal Renaissance patterns. mage Chris Denning/Verve Garden Design. In some gardens, carefully considered patterns perform a distinct function in the design. Parterres and Knot gardens (created with low hedging plants or herbs arranged into intricate patterns) are often designed to be viewed from upstairs house windows. At Broughton Grange (above), Tom Stuart-Smith has created an informal parterre of Buxus filled seasonally with tulips or strong-coloured flowers to give a modern twist to a historical garden feature. The Box hedging has been clipped into repeated patterns modelled on the cells that make up leaves. Herbs such as Teucrium, Lavender and Rosemary in repeated patterns make up the knot garden at Haddon Hall in Derbyshire. Desinger: Arne Maynard. Image: Chris Denning/Verve Garden Design. Arne Maynard has also captured the essence of an Elizabethan Knot garden at Haddon Hall, using herbs such as Lavender and Rosemary instead of Box plants. Although left unclipped for much of the season to create a looser framework, the structural patterns are still evident and important. These types of garden do not need to be large and can be adapted to small spaces, where the repeated shapes work well echoing some aspect of the house architecture. At the walled garden in The Garden House (shown below), repeated blocks of perennials at the front of the borders lead the eye cleverly through the entire length to the doorway focal point and the landscape beyond. By using blocks of similar size and repeating dominant pinks, reds and purples, the viewer gets a sense of scale of the walled garden and its importance in the wider area. You could use the same trick in smaller borders to draw attention to a sculpture, inviting bench or summerhouse. Blocks of repeated strong colours at the front of the border lead the eye deep into this garden and to the view beyond at The Garden House. mage Chris Denning/Verve Garden Design. Has this given you an idea of what to repeat in your garden?